From Country Borders to Economic Borders; The EU’s two hearts and 27 Mindsets on a path of “Mutually Assured Decline”? Dealing with China where the Periphery is the Center; The reservoir of innovation our evolutionary era provides; New rules in Communication in the shift from word to visual. But Mind Set! goes beyond that. 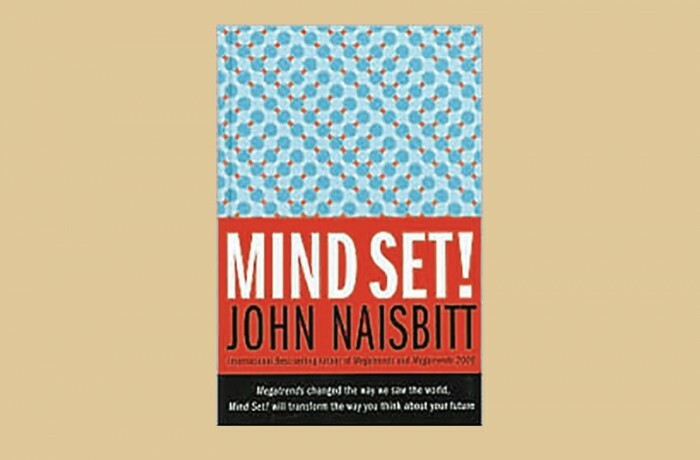 John Naisbitt opens the door to what enables him to see the future: deliberately developed mindsets. The first part of the book is defining and exemplifying 11 Mindsets as tools to evaluate and select information and put together the pieces that will form new pictures of the future. It also shows the impact those mindsets can have in business, politics, government and personal life.